KSDA students join effort to eliminate loneliness! We our proud that our students are part of a grant from Southern Adventist University! They have joined forces with kids from abound the country to eliminate loneliness, one person at a time. Several of our students have been selected to participate in a grant to spread the love of Christ to those who are lonely! 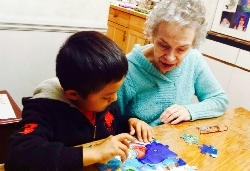 The Partners for Eternity (PFE) grant out of Southern Adventist University partners children with senior mentors who have limited contact with family or friends. Students in the program make weekly visits to help with chores, share stories, and spend time together. The grant pays money on the students' bill for spending time with the senior mentors, but that is only one of the benefits to our students. Parents, who are there during the visits, report that the children look forward to the time with their senior mentors. Many of our students live far from their grandparents so the senior mentors have become surrogate grandparents! We currently have 5 students in the program and we hope to expand it throughout the year. If you would like more information, or contribute, please contact Karen Murcia. Please watch the video for more information on this innovative program!